ZTE MF60 WiFi hotspot is a 3.5G mobile hotspot device, working in GSM/GPRS/EDGE/WCDMA/HSPA+ network. The client device could connect to it via USB or Wi-Fi interface. With HSDPA 21Mbps downlink, quad-band GSM and tri-band UMTS, it gives maximum 8 users super fast Internet experience all over the world at the same time. It runs on battery and has a mini USB port and a built-in OLED display on the top and could supports up to 32GB Micro SDHC memory. The device supports data and SMS services, enabling you to communicate anytime and anywhere. * This HSDPA device is peak rated at 21 Mbps downlink speed. 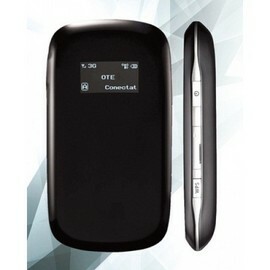 * Operates on the 3G networks for wireless access to e-mail and internet on the move. * Use 802.11b/g Wi-Fi connection so no installation is required. Simply enter the password key supplied and get on line immediately with your Next G'SIM. * Small, light weight design. * Supports three working modes: USB Mode, Wi-Fi Mode, Mixed Mode.